*The Anchor Investor Bid/Offer Period shall be one Working Day prior to the Bid/Offer Opening Date, being, Tuesday, December 5, 2017. Future Supply Chain Solutions Limited (the “Company”) proposes to open on Wednesday, December 6, 2017, an initial public offering of up to 9,784,570 equity shares of face value of Rs. 10 each (“Equity Shares”) for cash at a premium (the “Offer”) through an offer for sale of up to 7,827,656 Equity Shares by Griffin Partners Limited (the “Investor Selling Shareholder”) and up to 1,956,914 Equity Shares by the Company’s Promoter, Future Enterprises Limited (the “Promoter Selling Shareholder”, together with the Investor Selling Shareholder, the “Selling Shareholders”). The Offer closes on Friday, December 8, 2017. The Offer would constitute up to 24.43% of the post-Offer paid-up Equity Share Capital. The Anchor Investor Bid/Issue Period, shall be one Working Day prior to the Bid/Issue Opening Date, being, December 5, 2017. The Price Band for the Offer is fixed from Rs. 660 to Rs. 664 per Equity Share. Bids can be made for a minimum lot of 22 Equity Shares and in multiples of 22 Equity Shares thereafter. The Equity Shares are being offered through the Red Herring Prospectus dated November 27, 2017 (the “RHP”) and are proposed to be listed on the BSE Limited (“BSE”) and the National Stock Exchange of India Limited (“NSE”). The Global Co-ordinators & Book Running Lead Managers ("GCBRLMs") to the Offer are Edelweiss Financial Services Limited, CLSA India Private Limited and Nomura Financial Advisory & Securities (India) Private Limited. The Book Running Lead Managers (“BRLMs”) to the Offer are IDFC Bank Limited, IIFL Holdings Limited and YES Securities (India) Limited. The Offer is being made in accordance with Regulation 26(1) of the Securities and Exchange Board of India (Issue of Capital and Disclosure Requirements) Regulations, 2009, as amended (the “SEBI ICDR Regulations”), through the Book Building Process wherein not more than 50% of the Offer shall be allocated on a proportionate basis to Qualified Institutional Buyers (“QIBs”), provided that the Company, in consultation with the Selling Shareholders and the Lead Managers, may allocate up to 60% of the QIB Portion to Anchor Investors on a discretionary basis, out of which one-third shall be reserved for domestic Mutual Funds only, subject to valid Bids being received from domestic Mutual Funds at or above the Anchor Investor Allocation Price, in accordance with the SEBI ICDR Regulations. 5% of the QIB Portion (excluding the Anchor Investor Portion) shall be available for allocation on a proportionate basis to Mutual Funds only, and the remainder of the QIB Portion shall be available for allocation on a proportionate basis to all QIB Bidders (other than Anchor Investors), including Mutual Funds, subject to valid Bids being received at or above the Offer Price. Further, not less than 15% of the Offer shall be available for allocation on a proportionate basis to Non-Institutional Bidders and not less than 35% of the Offer shall be available for allocation to Retail Individual Bidders in accordance with the SEBI ICDR Regulations, subject to valid Bids being received at or above the Offer Price. All potential investors, other than Anchor Investors, are required to mandatorily utilise the Application Supported by Blocked Amount (“ASBA”) process providing details of their respective bank account which will be blocked by the Self Certified Syndicate Banks (“SCSBs”) to participate in the Offer. Anchor Investors are not permitted to participate in the Anchor Investor Portion through the ASBA process. 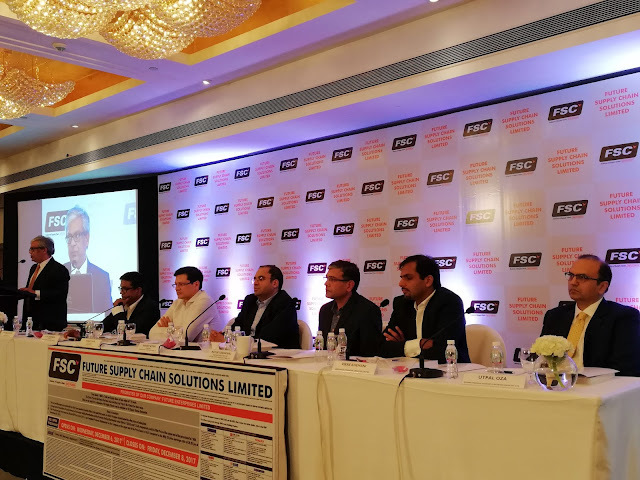 FUTURE SUPPLY CHAIN SOLUTIONS LIMITED is proposing, subject to receipt of requisite approvals, market conditions and other considerations, to make an initial public offer of its equity shares and has filed the RHP with Registrar of Companies, Maharashtra (“RoC”). The RHP is available on the websites of SEBI at www.sebi.gov.in and at the websites of the GCBRLMs at www.edelweissfin.com, www.india.clsa.com and www.nomuraholdings.com/company/group/asia/india/index.html, respectively and the BRLMs at www.idfcbank.com, www.iiflcap.com and www.yesinvest.in, respectively. Investors should note that investment in equity shares involves a high degree of risk and for details relating to the same, please refer to the RHP including the section entitled “Risk Factors” on page 17 of the RHP. The Equity Shares have not been and will not be registered, listed or otherwise qualified in any other jurisdiction outside India and may not be offered or sold, and Bids may not be made by persons in any such jurisdiction, except in compliance with the applicable laws of such jurisdiction. The Equity Shares have not been and will not be registered under the US Securities Act of 1933 (“U.S. Securities Act”) or any state securities laws in the United States and may not be offered or sold within the United States, except pursuant to an exemption from, or in a transaction not subject to, the registration requirements of the U.S. Securities Act and in accordance with any applicable United States state securities laws.